The second Full Moon in Aquarius of the year, the Water Bearer dances with the Sun in Leo, demonstrating what it is to be truly generous, especially after so many of us may have experienced the heat of burnout in the past few weeks. In the Twenty-Sixth Mansion, our August Full Moon is oozing with the pleasure of devotion to those we hold dear in our lives. As a fixed Air sign, Aquarius Moon energy is unusual and when the Moon moves into the house of the Water Bearer we feel it. Moods shift, priorities abruptly change, there is social upheaval, and the craving for freedom reaches new heights when the Moon is in Aquarius. As a sign of eccentricity mixed with the possibility of changing the world, the Moon in Aquarius is a time to network, invest in community building, and looking out for the welfare of others. The mood shift that occurs during an Aquarius Moon can be optimistic or pessimistic – a lot depends on how much freedom you feel you have access to. The freedom to move, express, and be unconventional is what makes the Aquarius Moon shine. 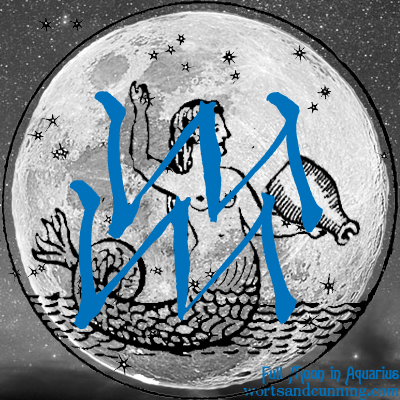 Learn more about the Moon in Aquarius and Aquarian herbs to work with at the Lunar Apothecary.